Did psychiatric drugs cause the violent behavior of Washington Navy Yard shooter, Aaron Alexis? One Member of Congress has hinted at the connection and has stepped up to the plate to make an official inquiry into the gunman’s psychiatric drug background. U.S. Representative Miller (R-Fla.), chairman of the House Committee on Veterans’ Affairs, apparently is savvy enough on the issue to tell a local Washington, D.C. radio station that “One of the medications that Alexis received does have a side effect that could in fact have been a problem.” Chairman Miller has directed the Department of Veterans’ Affairs to save all records relating to Alexis for review. While it is extraordinary news that a federal lawmaker finally, at a minimum, is willing to consider that there may be a connection between the shooter’s violent behavior and psychiatric drug “treatment,” what is not known is whether Chairman Miller will stop at Alexis or look at the bigger picture. The overwhelming data supporting a connection between psychiatric drugs and violence, screams for a thorough investigation. That Alexis (like so many of the shooters before him) had been prescribed a psychiatric mind-altering drug, and was taking, Trazodone, an antidepressant with known severe adverse reactions associated with violence, may only be the tip of the iceberg. While it is imperative to know Alexis’ complete psychiatric drug history, Chairman Miller must also consider the numerous other shooting incidents which reveal the commonality – all were on or withdrawing from psychiatric drugs. The research has been available for years. There are 22 international drug regulatory warnings on psychiatric drugs citing adverse effects such as mania, hostility, violence and even homicidal ideation. At least 31 school shootings and/or school-related acts of violence have been committed by those taking or withdrawing from psychiatric drugs, resulting in 162 wounded and 72 killed. Between 2004-2012, there have been 14,656 reports to the FDA’s MedWatch system on psychiatric drugs causing violent side effects, including more than 1,400 cases of homicidal ideation/homicide, nearly 3,300 cases of mania and 8,200 cases of aggression. Despite the known serious adverse reactions, antidepressants are the second most prescribed group of drugs in America. 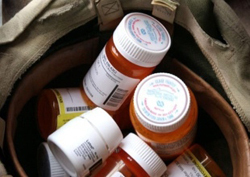 And, although Chairman of the House Committee on Veterans’ Affairs, Congressman Miller may be unaware of the growing psychiatric drug problem among active-duty military and veterans. For example, at least 17 percent of active-duty military personnel currently take at least one antidepressant and one in six military service members take at least one type of psychiatric drug—All of which have been documented to mania, psychosis and/or violent reactions. Beyond the research, studies and private sector and governmental reports, there are numerous experts who, for years, have had the courage to speak out about the connection between psychiatric drugs and violence. Psychiatrist, Peter Breggin, M.D., has written dozens of scientific articles and numerous professional books, including Medication Madness: The Role of Psychiatric Drugs in Cases of Violence, Suicide and Crime (2008) and is on the editorial board of several journals. Dr. David Healy, a professor of Psychiatry in Wales, is one of three researchers who published a study in the September 2006 issue of the journal Public Library of Science Medicine that determined that SSRI antidepressants could increase the risk of violence in people taking them. These and many other doctors long have understood that violent behavior, aggression, mania and suicidality may be caused by psychiatric drug “treatments” and would, no doubt, gladly share with Congress their impressive experience and research. Chairman Miller’s questioning of Alexis’ psychiatric drug “treatment,” and his commitment to an official inquiry, is a courageous first step in understanding the psychiatric drug epidemic ravaging the nation. It is not a moment too soon. Lives hang in the balance.